This post will be a quick practical guide for the Angular HTTP Client module. We will cover how to do HTTP in Angular in general. We will be using the new @angular/common/http module, but a good part of this post is also applicable to the previous @angular/http module. We will provide some examples of how to use this module to implement some of the most common uses that you will find during development. Note: The code for this post is also available in this repository, as a running example. The multiple versions of the Angular HTTP module all have an RxJS Observable-based API. This means that the multiple calls to the HTTP module will all return an observable, that we need to subscribe to one way or the other. With this in mind, let's have a look at some of the most common tasks that we will come across using the HTTP library. Let's now start using the HTTP module, and use it to perform a simple HTTP GET. Just as a demo, we will be querying a Firebase database using the built-in REST capabilities of Firebase, and displaying some data directly on the screen. 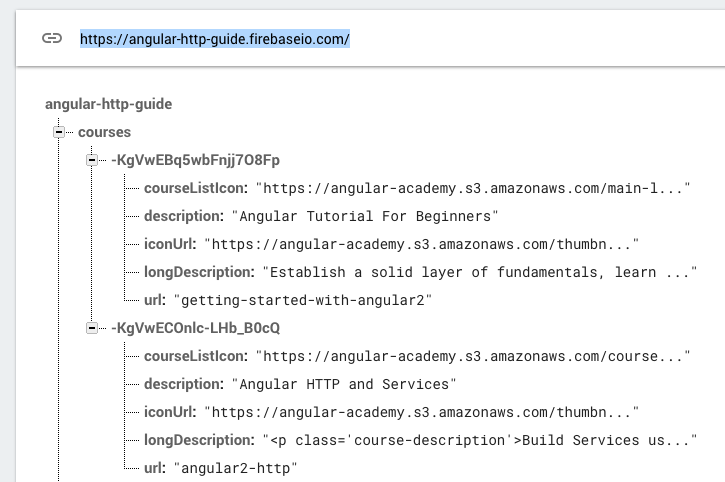 This is not the most common way to query Firebase, as we usually use AngularFire together with the Firebase SDK, but there is also REST support available. As we can see this data is a JSON structure, with no arrays. Everything is structured as a key-pair dictionary. Those funny looking strings are Firebase unique identifiers, they have some great properties (more about them in this post). And here is an example of a small component that queries the database above using an HTTP GET, and displays the data on the screen. The end result is that the descriptions of all the courses in the database will show up listed on the screen, in a bulleted list. Notice in the call to get() that we are passing a generic parameter: we are specifying that the result of the get() call will be an Observable of Course, meaning that this observable emits values which are arrays of courses. If we don't specify a type parameter, then the result of the call to get() will be an Observable<Object> instead. This query will take the same results as before, but this time ordered by the $key property. The first URL parameter that we have in this URL is orderBy, and the second is limitToFirst. Notice that we are building the HTTPParams object by chaining successive set() methods. This is because HTTPParams is immutable, and its API methods do not cause object mutation. If we try to populate our parameters like this, we will not have the expected result. Instead, we would have an empty HTTPParams object, and the two calls to set would have add no effect. This syntax is more generic because we are passing in an initial argument which defines the HTTP method that we are using, in this case GET. As we can see, HttpHeaders also has an immutable API, and we are passing a configuration object as the second argument of the get() call. This configuration object only has one property named headers, just like the local const that we defined - so we used the object short-hand creation notation to define the configuration object. Just like in the case of GET, we can also use the Angular HTTP Client to do all the other available HTTP methods, namely the methods typically used for data modification such as PUT. The PUT observable is now completed. So as we can see, the PUT call will replace the whole content of the course path with a new object, even though we usually only want to modify a couple of properties. Also, the response body of the PUT call will contain the new version of the course object that was created after the upload. In some cases, this might be a lot of data. Most often than not, instead of providing a completely new version of a resource, what we want to do is to just update a single property. And this is the main use case for the use of the HTTP PATCH method! The PATCH observable is now completed. As we can see, the PATCH method returns only the new version of the modified values, that we already sent initially. This is useful in situations where there is some sort of further server-side modification of the patched values, such as for example via a database trigger or a Firebase rule. The DELETE observable is now completed. In the case of Firebase, this completely removes the object from the database, but we can imagine other REST APIs where only a logical delete would occur. If the operation that we are trying to do does not fit the description of any of the methods above (GET, PUT, PATCH, DELETE), then we can use the HTTP wildcard modification operation: POST. The POST observable is now completed. When we use the POST method to create data in the database, we usually want to return the unique identifier of the data that we just created, so that the client can reference that new resource if needed. Depending on how you use the HTTP module, a problem that you might come across is the occurrence of multiple HTTP requests. This is actually the normal behavior of the HTTP observables, but it might be surprising the first time that we see it. Sometimes we want to create an observable, and then subscribe to it straight away to implement some functionality which is local to the place where we created the observable. In this example, we are creating an HTTP observable, and we are doing some local subscription to it. Then this observable is assigned to the courses$ member variable, which will then also be subscribed to using the async pipe, via the component template. This means that there will be two HTTP requests, once per each subscription. In this case, these requests are clearly duplicate as we only wanted the data to be queried from the backend once. There are several ways to avoid this situation, but there was recently an operator added to RxJs specifically to tackle this use case - the shareReplay operator. With the shareReplay operator in place, we would no longer fall into the situation where we have accidental multiple HTTP requests. And this covers the main use cases for doing the most typical read and modification operations, that we would implement while doing a custom REST API. Let's now see some other very frequent use cases, plus some more new features of the Angular HTTP client. In this example, we are taking HTTP GET observables and combining them to create a new observable. This new observable will only emit a value when the two GET observables emit their value. The value of the combined observable will be an array containing the multiple results of each GET request. Notice the use of a generic parameter in the call to get(). This is optional and it helps to keep out program more type safe. If we don't use the generic type, then the inferred type of the course variable would be Object, but using this parameter the inferred type is now Course, which gives us auto-completion inside the function passed to switchMap. the values of the inner observable (that creates a PUT request) are emitted as values of the result observable. Have a look at this previous post on switchMap, this operator is likely to be helpful in several different use cases (not only this one). For example, we can also use it in this other closely related use case. In the previous case, we used switchMap to chain two HTTP requests together, creating one request based on the results of the first request. But the result observable did not have the data of the first request, instead it only had access to the data of the second HTTP request. The emitted values of the outer result observable with then become an array that contains the two value emitted by each HTTP request in the chain. Notice that selector functions are not unique to the switchMap operator, they can be used in many other operators. Also, in these examples, we have used switchMapto chain two HTTP calls, but we could continue calling switchMapon the result observable and keep chaining more calls. One of the biggest advantages of RxJs is the built-in error handling functionality, which is hard to get right while doing asynchronous programming. Notice that by using the catch operator, the error handling function of the result observable would never get called, because the error thrown by the HTTP observable was caught by the catch operator. A new feature available in the new HTTP client is HTTP Interceptors. An HTTP Interceptor allows us to add some generic functionality to all our HTTP requests in only one place. Interceptors are ideal for cross-cutting concerns like for example adding an authentication token header transparently to all the requests made by the HTTP client. The new Angular HTTP Client is a great evolution when compared to the previous HTTP client: it's more user-friendly and helps to improve the type safety of our code. It also supports several extra use cases: for example interceptors and progress events. This new HTTP client will exist side-by-side with the previous HTTP module, to allow an easier migration. I hope that this post helps in getting started with the new HTTP client, if you have some questions please let me know in the comments below and I will get back to you.